Home Enlivening On What Can We Rely? On What Can We Rely? There is but only one person we can depend on and if I was to respond to that question with any other answer than, it is ourselves that we can trust the most, then I would be lying. If you were thinking of nominating someone else, don’t be so sure. There is some good news, because we ourselves come as a ‘two for one’ package, in other words there are two of us, not just one that we can rely on every minute of the day. One of who we are is our Ego, and although the Ego has a really bad rap for not behaving and treating us well, we still need to be able to trust it when things get rough. There is a term called ‘flight or fight’, it is a mechanism in the body that enables us to mobilize a lot of energy rapidly in order to cope with threats or what we might perceive as dangerous situations. The Ego person in us is responsible for automatically putting our physical body on alert when it feels like we need protection. Although this response is somewhat primitive (it used to protect us from the proverbial sober tooth tiger back in the day) we know that the Ego part of us will send us signals to run like hell if we need to. We can trust our Ego to protect us when we are under any kind of stressful situation. There is another hat that we wear and this represents our Soul’s energy. This incredible energy or entity is the other part of who we are, that we can without any doubt what so ever trust 100%. The sensation comes as that little ‘feeling’ we get when we know something isn’t right, or vice versa. This subtle energy seems to whisper to us, we hear it in our head somewhere. Sometimes the whispers get louder and louder until we finally decide to listen. There is no emotion attached to the ‘voice’ inside of us, it is just there to guide us and help us make decisions that keep us on our life’s path. 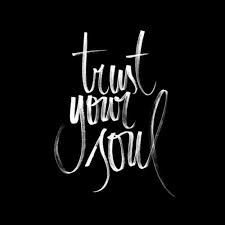 Our Soul is our best friend, our confidant and our most precious guide. Relying on our Souls voice to help with the evolution of our existence is vitally important. If you haven’t been listening to the whispers of your Inner Being, the good voice you hear in your head, then perhaps start to question yourself – On what can I rely?